Tired of looking through an endless stream of WordPress themes? Business Process Pro is a breath of fresh air for someone looking to create an ideal business platform for their users! The design is clean, modern and certainly one of a kind. 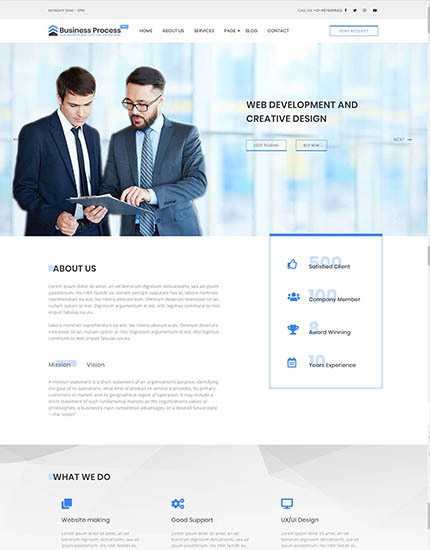 Built and designed to make your website stand out from the crowd, this theme features a responsive and retina-ready interface. It is flexible and user-friendly so that anyone from beginners to experts can use it. With tons of customizing options and highly adjustable layout structure, you will have the full control over the website. 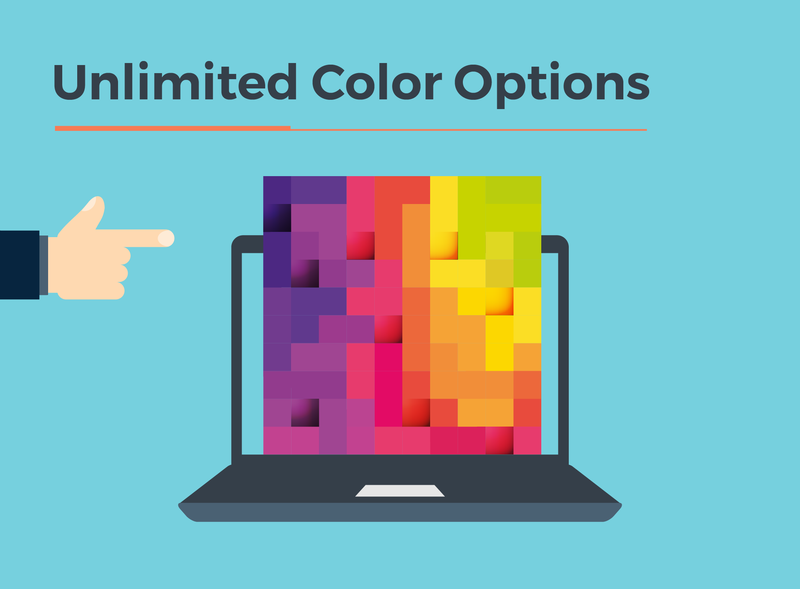 Get unlimited fonts options to match your preference alongside an unlimited color palette option. With everything that you could ask for; Business Process is the ideal choice no matter which business you are involved in! Customizing and creating a platform to suit your preference and needs has never been easier. That’s right, the user-friendly interface of the theme lets you easily add or modify the colour schemes of the website. While other themes of the similar niche may be limited to a certain amount of colour palette, that is not the case for Business Process. You can choose from unlimited colour schemes and palettes to perfectly suit the site. Choose to match your site with the logo of your company or go with the one that you like, it is completely up to you! 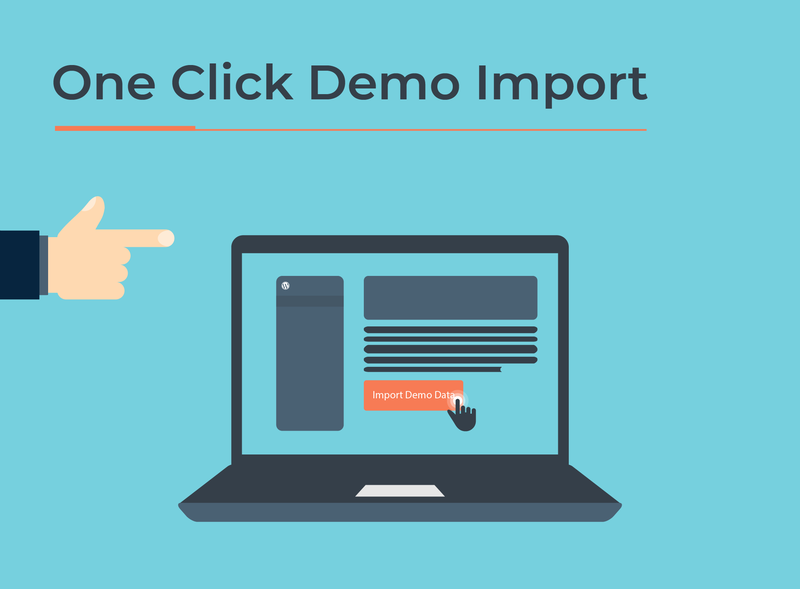 Another amazing feature of this WordPress business theme is the one-click demo import option available. That’s right! No need to spend your extra time and effort starting from scratch as this theme comes with everything ready-to-use. The demo will feature all the files and elements that are shown in the preview and you can easily get a head-start. Simply copy or import the demo files within a matter of minutes and go Live! You can either change the elements to your preference or leave it as it is. The choice is up to you. 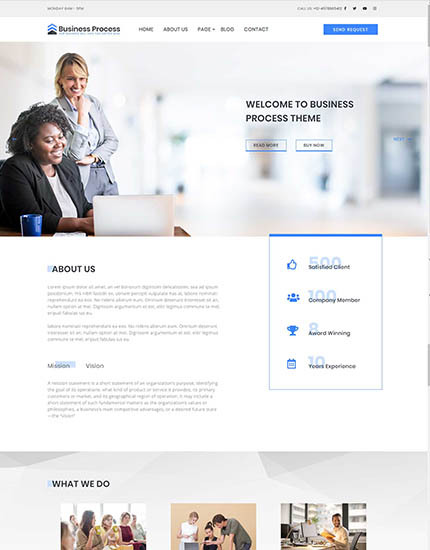 Because this theme is designed with all the entrepreneurs and business niche in mind, this theme includes features that are well-suited for them. That’s right, packed with tons of amazing tools and components like as Team Section, Portfolio Section, Service Section, Pricing Table and Twitter Feeds. You can easily utilize them to enhance the functionality. Unlike most other themes of similar niche, we have made sure to carefully implement elements that may be of use. These make sure that you no do not need to waste your extra time installing and activating the tools you need. One of the major aspects that determines the look of a site is surely the fonts and the typography it displays. With this amazing WordPress business theme, it includes a range of elegant and creative fonts that you can choose from. 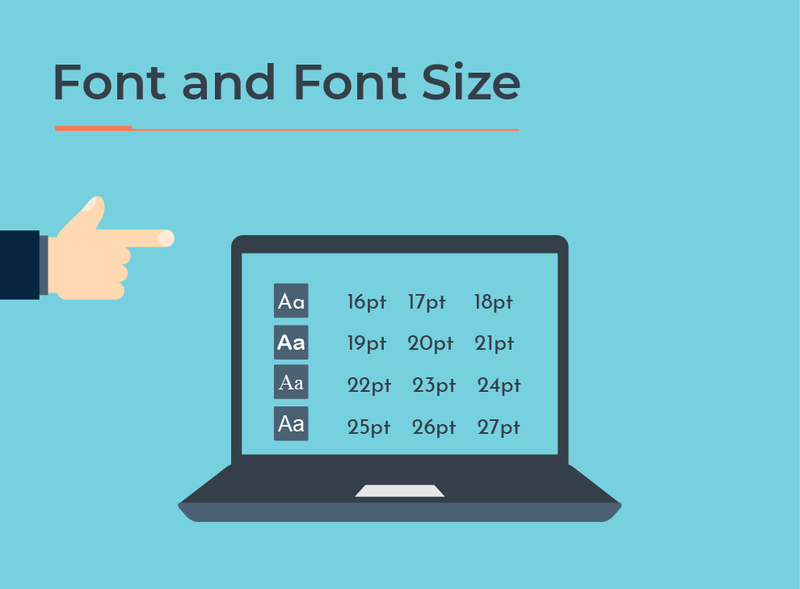 Pick out the ideal fonts to enhance the overall appearance of your website and leave a lasting impression. Another great thing about this template is the option to resize and modify the size of the fonts. You can choose a custom font size for each and every element displayed. We are sure that it will make a huge difference and makes your overall site easy to navigate and categorize! With Business Process, you also get 8 different Page templates so you no longer need to worry. 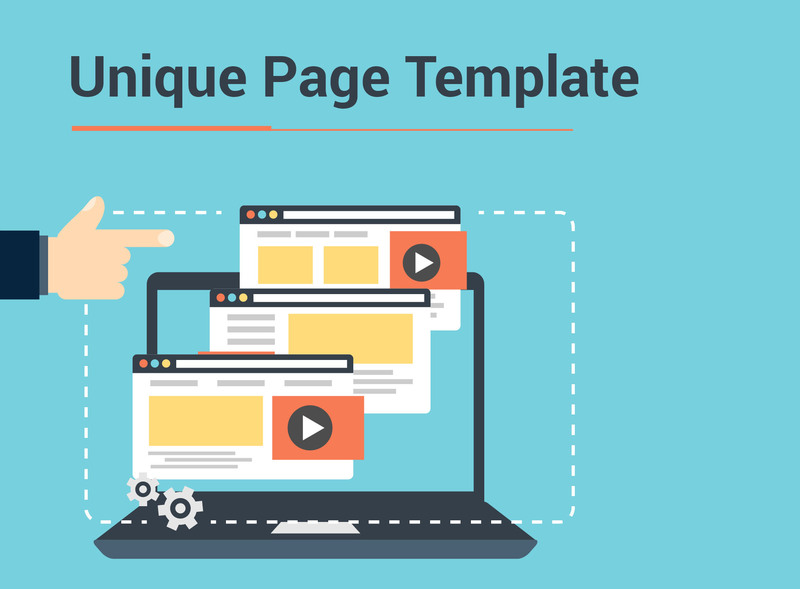 Probably packed with everything that you might need, these templates are all carefully designed with great attention to details Whether you need Career Page, About Us Page, Contact Page or more, you have it all at your disposal.